Restaurateurs say it's a great crossover sandwich, appealing to both vegetarians and meat-eaters. The typical banh mi is made by stuffing cold cuts, pâtés and pork products into a fluffy French roll with fresh herbs and pickled vegetables. But lately a lesser-known, vegetarian version of the classic Vietnamese sandwich has found its way onto at least four menus in and near Portland. The sandwich has shown up at Honey Paw, Green Elephant, South Portland convenience store and Asian sandwich shop Le Variety, and the Portland Food Co-op, where you can find it in the prepared foods cooler. Recipe adapted from “The Plantiful Table: Easy, From-the-Earth Recipes for the Whole Family” by Andrea Duclos. Wrap the tofu in cloth and place a heavy object on top for 20 minutes to drain the excess liquid. Then slice it into 1/2-inch thick slabs – you need just a few for this recipe – and fry in oil for about 4 minutes on each side, until golden. Toast the baguette, then slice it open. Spread the mayonnaise on the baguette. Pile on the toppings, including the fried tofu, and add a squeeze of lime and sriracha, if desired. Enjoy your báhn mì chay. TIP FOR LEFTOVERS: Chop too many veggetables or fry too much tofu? No worries. Make a deconstructed salad version for dinner or lunch the next day, or toss it all into a spring roll. Combine all the ingredients except the daikon in a medium bowl and stir until the sugar is completely dissolved. Add the daikon. Allow the mixture to pickle overnight in the refrigerator before serving. Keep refrigerated. The sandwich is a legacy of French colonialism in modern day Vietnam, marrying French-influenced baguettes and mayonnaise with Vietnamese-influenced pickled carrots and cilantro and mint. The tofu version is associated with the vegetarian traditions of Buddhist temple cuisine. In fact, Quang Nguyen, one of the owners of Le Variety and a Buddhist himself, said the store in South Portland’s Redbank neighborhood does attract customers from the Vietnamese Buddhist temple in South Portland. More noticeable, though, have been the customers from surrounding towns seeking out the off-the-beaten-path shop to try the tofu sandwich after the store promoted photos of it on Facebook. The Le Variety tofu banh mi is a bargain at $4.85, while the others range in price from $9 to $12. Nguyen said the tofu banh mi is the store’s top seller alongside the beef banh mi. The plant-based banh mi sandwiches in the Portland area share similar flavors, but have a number of differences, too: The tofu is generally fried, with the Green Elephant and the Honey Paw using Maine-made, organic Heiwa tofu. Both the Green Elephant and Le Variety season the tofu in a lemongrass marinade. The Honey Paw dunks it in tempura batter before frying and the bread is made in-house. The sandwiches at Le Variety and Green Elephant feature house-pickled carrots (and daikon at Green Elephant). Le Variety and the Honey Paw make their own mayonnaise, with eggs, but the sandwiches can be ordered without the mayo. The Green Elephant uses vegan mayonnaise, while the Portland Food Co-op banh mi has no mayonnaise. That is just one of the ways that the co-op’s banh mi is the least traditional of the four. In place of tofu, the co-op uses Maine-made, organic Lalibela tempeh marinated in Korean barbecue sauce and pan-seared. The carrots aren’t pickled. The sandwich is presented in a whole wheat wrap and comes with a container of red pepper vinaigrette dressing. The co-op’s banh mi now competes with the falafel sandwich – also vegan – as the grocery store’s top seller. Steve Quattrucci, the co-op’s deli manager, speculated that the meat-free sandwich’s sudden rise in local popularity is because a vegetarian banh mi appeals to non-vegetarians. 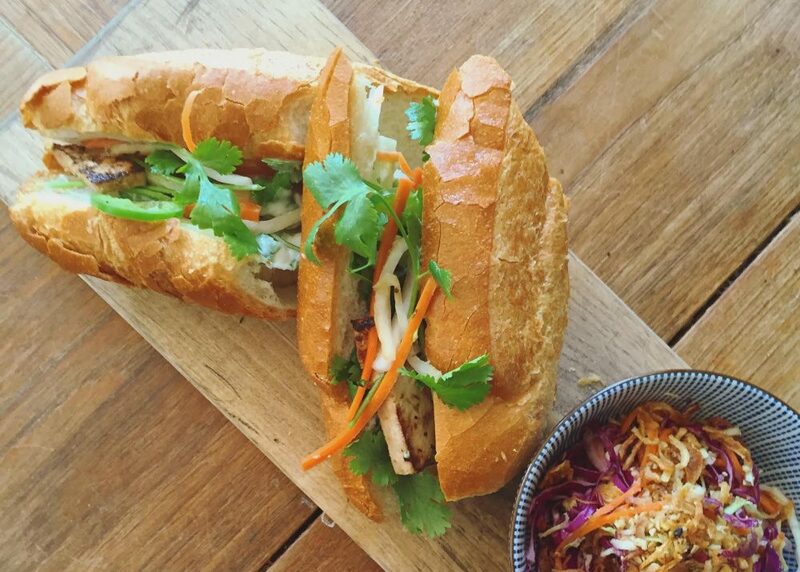 The Green Elephant has seen steady sales of its banh mi, said front-of-house manager Andy Cole. He attributed the appearance of vegetarian banh mi on local menus to the closing last year of Kim’s Sandwich Shop on St. John Street, which for years had offered an inexpensive tofu banh mi. Local grocers and restaurants, he said, are responding to the market void. The lifestyle blogger said the tofu banh mi is increasingly popular nationwide, in part as an extension of what she calls “bread culture.” Bread culture, she explained, includes everything from artisan bread to restaurants that serve only toast to more sandwiches on all menus.